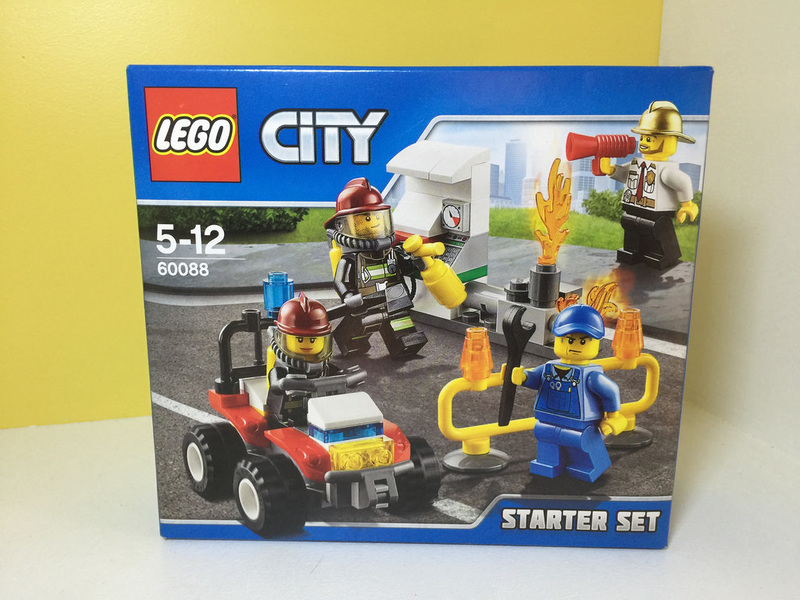 This set is a starter set, intended for those fans that are new to LEGO, or at least new to the City Fire subtheme. For a simple starter set, it’s got a bit going for it. This will be a very small review, as there’s really not much to talk about! The rather small box contains two parts bags and an instruction booklet. There’s nothing new that this set brings to the range, but there are some good parts, especially for a small starter set. There’s the gold fire helmet, the string with studs at the ends, and the yellow balustrade, just to name a few. 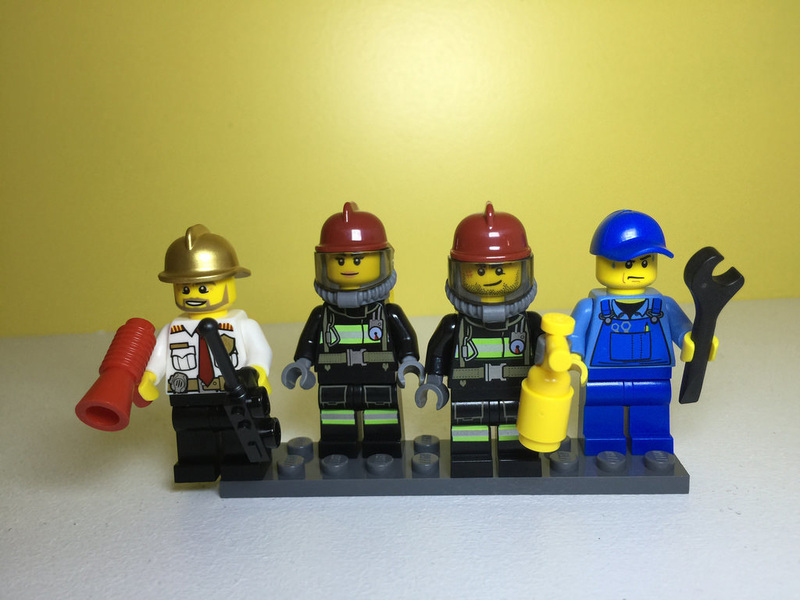 The minifigures in this set are pretty standard, apart from the fire chief. It’s great to have a fire chief finally! The other minifigures are pretty good, but we’ve seen them before. 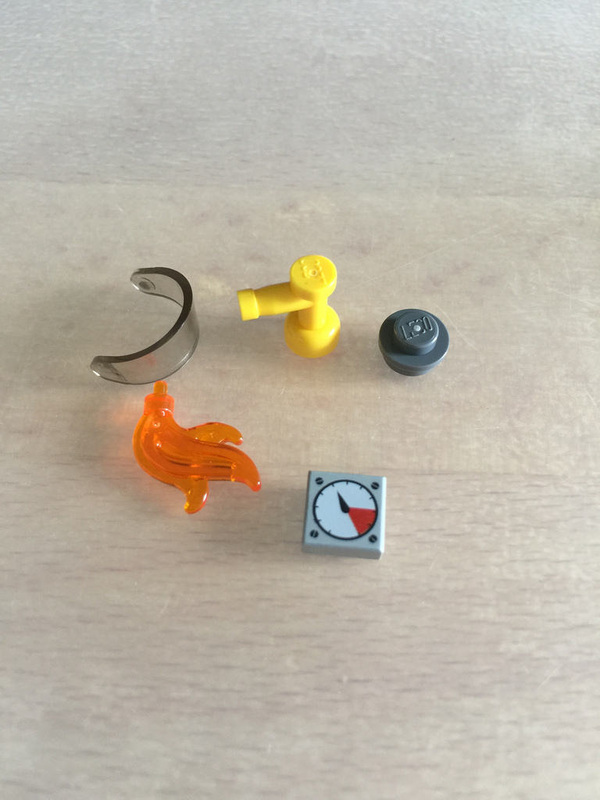 The spares aren’t too bad with this set – I got a printed timer 1×1 tile, a small flame (actually a feather), tap, visor and a 1×1 round plate. I’ve been chasing more fire for a while now, so I’m pretty happy with this result. This build comes together very quickly, with some pretty standard build techniques. The safety barrier is put together first, followed by the buggy, and then the petrol pump. It’s obviously not going to be very technical, as it’s aimed at a beginner level. I would like to know what the part of the pump that’s on fire is supposed to be. We don’t have pumps that look like that in Australia! If anyone has any ideas, please get in contact with me. 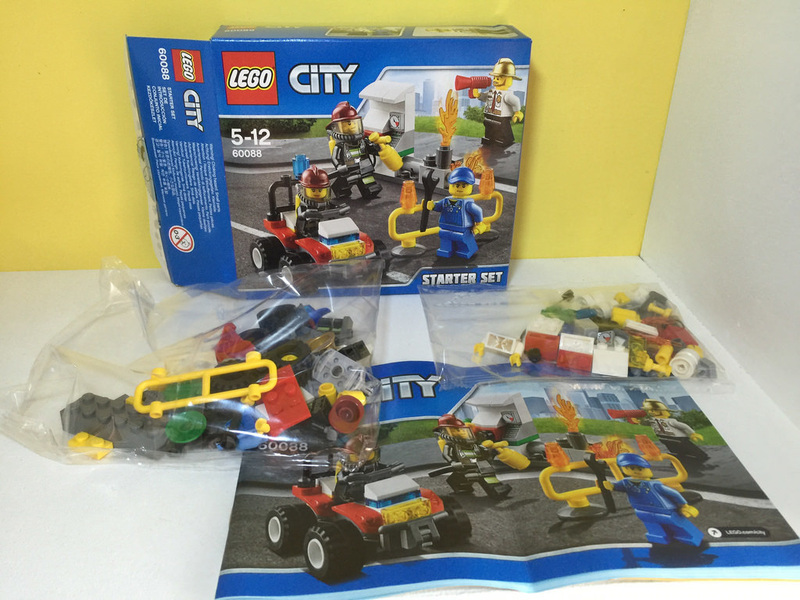 One thing that I found very odd about this set was the mistakes in the instructions! 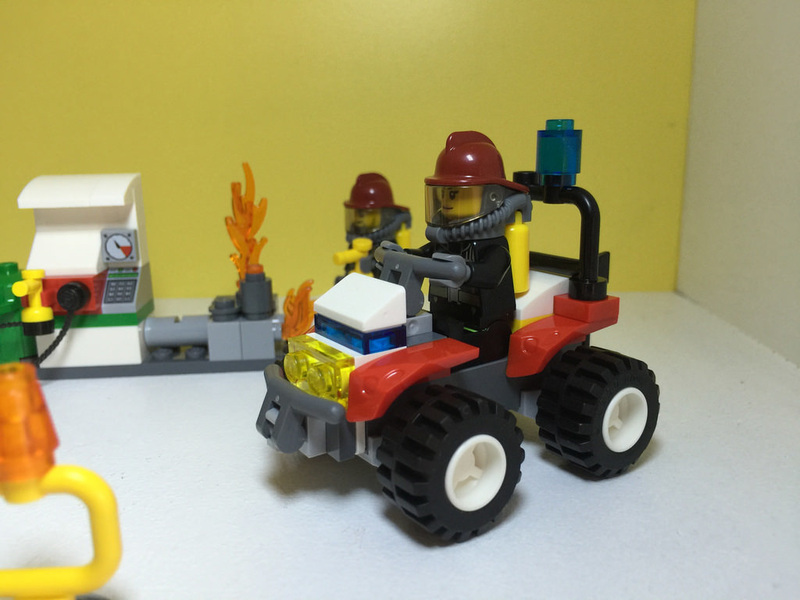 During the build of the buggy, it appears the designers have accidentally left in the minifig’s legs, that are magically stuck inside the brick. This isn’t just a single occurrence either, it happens on a few pages, at different angles. 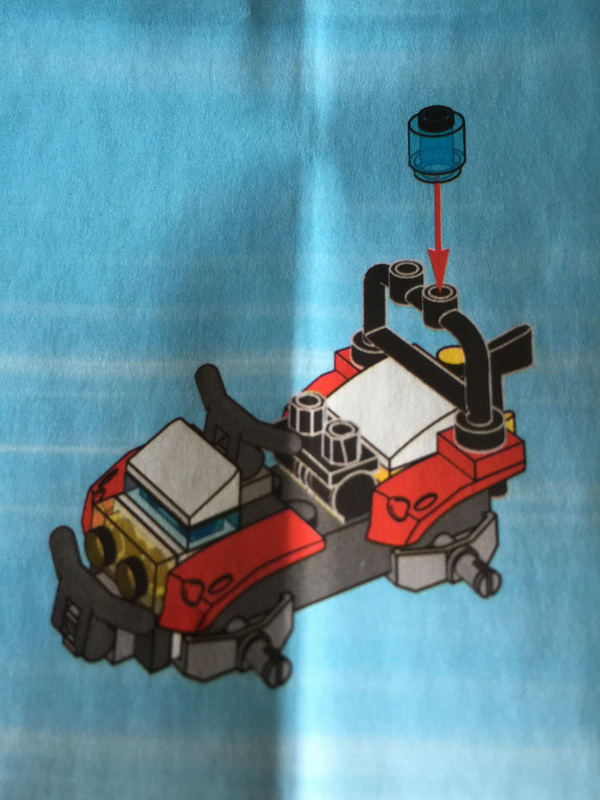 I’ve never seen a mistake like this in a LEGO instruction manual before. Ok, let’s wrap this up. This set gets 6 out of 10 mystery minifigure legs. It’s very simple, has limited playability, pretty basic elements, and doesn’t really add all that much to the range. 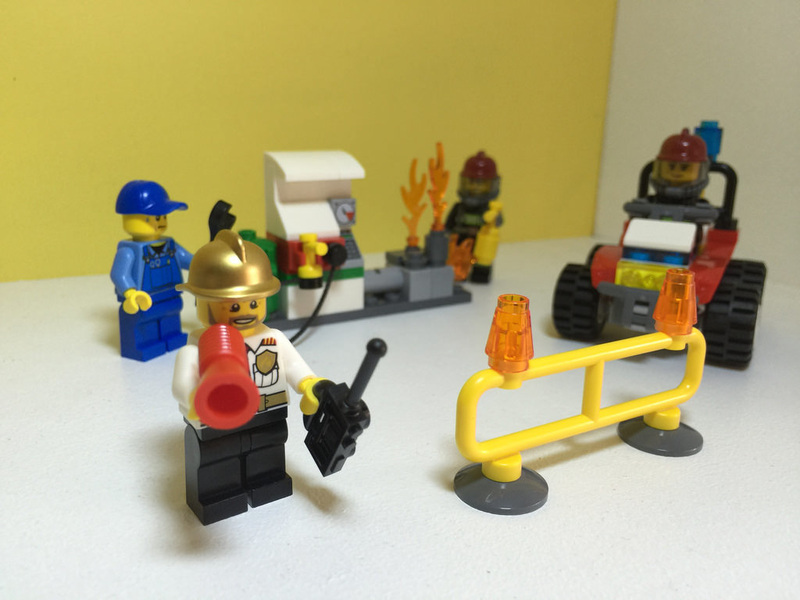 The Fire Chief is great, but that’s about it, if you’re thinking sets, not individual elements. Next on the review list is the first of the LEGO Pirates sets, 70409: Shipwreck Defence. I’m very excited about these ones – a return to my childhood! 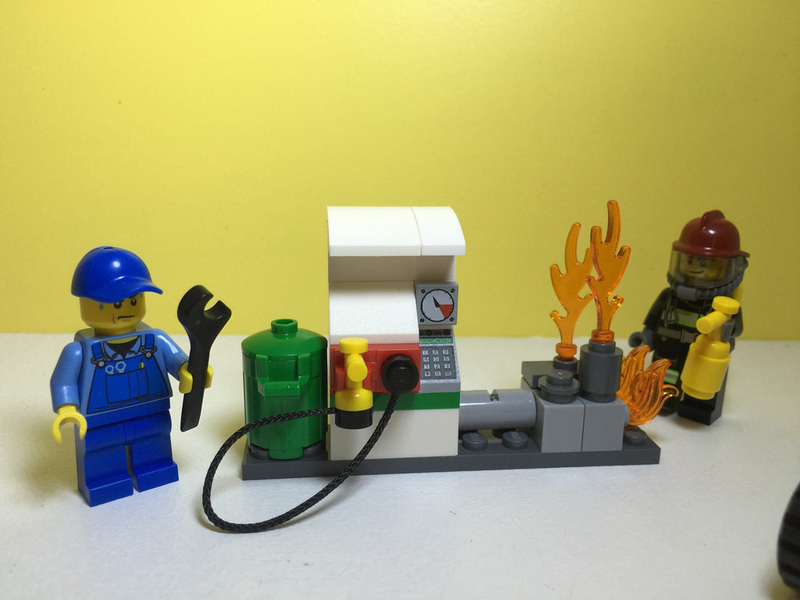 Do you have your own thoughts about the Fire Starter Set? Let me know in the comments. Remember, there’s also Facebook and Instagram!